India has joined the race to develop hypersonic weapons. In the works since the early 2000s, the Hypersonic Technology Demonstrator Vehicle (HSTDV) is designed to demonstrate and validate technologies needed for flight at speeds of more than Mach 5. Data gleaned from the project are expected to inform future reusable launch vehicle and cruise missile development. New Delhi has previously announced plans to develop a hypersonic variant of its supersonic BrahMos cruise missile. The HSTDV is designed to be carried to an altitude of about 100,000 feet (30,000 m) by an Agni A1 rocket, after which the hypersonic vehicle would be released. The baseline goal is to achieve 20 seconds of flight at Mach 6 with the air vehicle. The vehicle is fitted with an air-breathing scramjet engine that is expected to produce around 1,350 pounds of thrust. A range of wind-tunnel testing has been completed but work on the program has been hindered by a lack of funding and appropriate facilities in India. 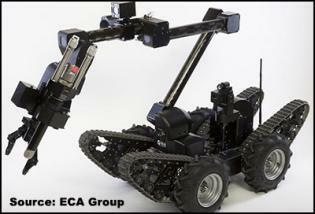 ECA Group in France has designed the Iguana unmanned ground vehicle for explosive ordnance disposal missions. The robot can also perform intelligence, surveillance and reconnaissance operations. A variant for chemical, biological, radiological and nuclear (CBRN) missions has been proposed. The modular system can be equipped with different manipulator arms and other equipment based on mission requirements. The chassis includes four wheels and four independent tracks. Multiple controller options are available. The Iguana was first shown off publicly at the DSEi exhibition in London in September 2015. Development was completed in May 2017 and France placed a US$11 million contract for 15 robots in January 2018. Deliveries were to be completed within 40 months. Another 43 vehicles may be ordered by 2024 at a cost of up to US$22.5 million, according to the manufacturer. Monaco's Dept. of Public Safety has also ordered the robot to replace its aging ECA Castor systems. 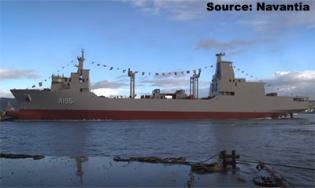 Australia is buying two replenishment ships from Spanish shipbuilder Navantia. The Supply class will replace the navy's current oilers, the Success and Sirius. Based on the Spanish Cantabria class, the ships are designed to carry fuel, dry cargo, water, food, ammunition, equipment and spare parts to support deployed naval and ground forces. The class is primarily intended to support Australia's Canberra-class amphibious ships and Hobart-class destroyers as part of a task force. Canberra ordered the two ships in a US$458 million deal in May 2016. Australian industry is supplying communication and combat systems, logistics support and components of the onboard cranes. Initial steel-cutting took place in June 2017 and the Supply was launched at Navantia's shipyard in Ferrol on Nov. 23, 2018. The following day, the keel was laid for the Stalwart. Both ships are expected to enter service in 2020, according to Australian navy chief Vice Adm. Michael Noonan. Another new record this month is China's DF-16 medium-range ballistic missile, which is designed to defeat Western missile defense systems in Taiwan and elsewhere along the so-called first island chain in the Western Pacific. The DF-21 (NATO: CSS-5) record, China's "carrier-killer" missile, has also been updated. The record on the secretive U.S. X-37B orbital space craft has been refreshed. A number of anti-radar missiles have been brought up to date, including the British ALARM, French Armat and Russian AS-11 Kilter and AS-17 Krypton. Unmanned vehicle updates include the FanWing and FR-102 remotely piloted aircraft and the Trailblazer remotely operated vehicle. The latter has been providing mine countermeasures capabilities to the Canadian navy since 1995. The Fast Raiding Interceptor and Special Forces Craft (FRISC), built by British firm Maritime Specialized Technology, has been acquired by the Belgian and Dutch militaries for their marine and special operations forces. The latest information has also been provided for the Seychellois patrol craft Andromache and the Spanish Galerna-class submarines. Air defense records have not been neglected, with new information for the German/Swiss 35-mm Skyshield and Chinese 57-mm Type 80 systems, as well as the U.S. Advanced Test High-Energy Asset equipped with a 30-kW laser. Sensor updates include the German TRS-3D naval radar, Russian Fan Song missile-control radar and the German Fast Infrared Search and Track (FIRST) reconnaissance system. Algeria has been experiencing a popular uprising against sickly President Abdelaziz Bouteflika, even after he withdrew his plans to run for a fifth term. Our editors have brought together the latest information on the nation, which is also a key player in the fight against terrorist groups in northern Africa. The orders of battle for Denmark and Sierra Leone have also been updated, as well as the record on the India-based Babbar Khalsa International terrorist group. February 2019 saw skyrocketing tensions between longstanding rivals India and Pakistan in the disputed Kashmir region. From a deadly terrorist attack to conflict in the skies, Nations Editor Kevin Ivey reviews the situation in "Clashes Over Kashmir." Aging fighter fleets in Europe have a number of countries looking for replacements. Growing concerns about Russian aggression and its investments in electronic warfare and area denial technologies have some buyers looking beyond the technical specifications for the best aircraft for their needs. Reuben Johnson looks at these issues in "New Fighters For The Front Line." Finally, rapidly advancing technology means rapidly developing threats. From biotechnology and the cyber realm to electronics and unmanned systems, new challenges await. Andy Oppenheimer has the details in "New Technology Brings New Threats."